Temporary migration is of growing significance in Europe. 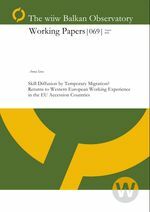 Upon migration to a country with higher technological development that typically coincides with positive wage differentials, temporary migrants may upgrade their skills by learning on the job and subsequently import the newly acquired human capital to their source country, thus adding to international know-how diffusion and the catching up of the respective economy. This paper is the first to provide supportive evidence of this hypothesis in a cross-country East to West European perspective, using the 2003 Youth Eurobarometer dataset.